When it gets too hot at night, you will obviously have difficulty sleeping. Therefore, it would be wise to invest in bedding that enhances cooling at night. Such bedding can either be cooling sheets or cooling pillows. The heat could be as a result of no air conditioning in the room, and it is hot and humid, or it could even be menopause. Regardless of whichever reason you experience night sweats, it would be wise to invest in a good pillow. 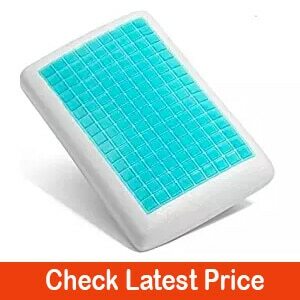 Therefore this article is going to help you be able to quickly and wisely pick out the best cooling pillow. This USA based pillow has a cover with an extra breathable provision. It contains three different materials. They are bamboo, lycra, and polyester at 43%, 6%, and 51% respectively that will ensure you have a cool night. On the inside of the pillow is a combination of shredded memory foam. The way in which the memory foam is made you can be sure of having a pillow that will stay robust and side sleepers can be sure of not having neck pain. Another impressive feature of the Snuggle-Pedic is that it has an eco-friendly bio-green material and comes with a 20-year warranty and 90-day free trial. You can also ask for your customization if you are not okay with how it feels. It is customizable hence you can get it adjusted to whatever specifications you desire. 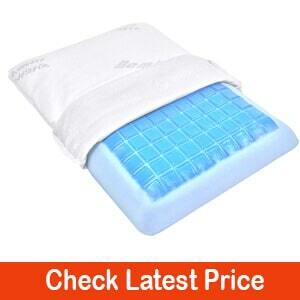 This type of cooling pillow comes in contour or square standard size. It has a spandex fabric cover, and you will surely have a good night experience. Another interesting feature of this pillow is the cooling gel used on the inside that ensures that disperses heat at night. The memory foam on the other side of the pillow cradles your neck by providing the support you need. This pillow will sort out two problems at once. This pillow is also hypoallergenic therefore anyone who is allergic to dust, bacteria and mite can feel safe while using it. It is also convenient for all side sleepers, back or stomach. To some, it may be too firm. 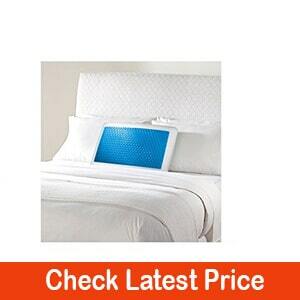 This pillow sold by Fine Trade contains a gel that takes away your heat ensuring that you have a good night sleep. It also has two sides that include a different material, one that has gel and the other doesn’t ensure that you can use it during different seasons. The memory foam also provides support for your neck and back hence relieves pressure. It also comes with a standard case that has a slight odor. It is advisable to let the pillow be well aired for the next 24 to 48 hours to get rid of the smell though the smell does no harm to you. This pillow by Sleep Folks is one of my favorite in the market. The cooling gel inside it will take care of heat at night, and you can sleep in peace. It is also interesting to know that pillows that contain gel retain their shape for a long time. You will use it for a long time without having to replace it. Using this pillow also provides your head and neck with the comfort you desire. The neck or back pain that has been disturbing you as a result of using the wrong bedding will be no more. The gel in the pillow is resistant to bacteria, dust, and mite which means those who have allergies can use it worry free of any reactions. Is highly durable hence once bought you won’t spend more money for a while. With this pillow, like most others, it carries out cooling at night due to the presence of cooling gel infused to the memory foam. Unlike most memory foams that don’t make cooling effectively, this one does an excellent job at it due to the infused gel. 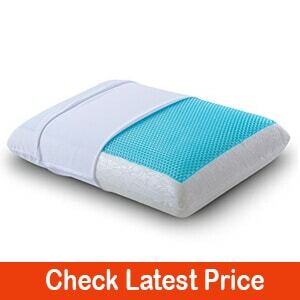 This pillow is also suitable for side and stomach sleepers. It is only 2.5 inches thick and will, therefore, be soft and still provides support for your head and neck. It is also a dual sleeping surface, and you can use it to sleep on whichever side you find best. 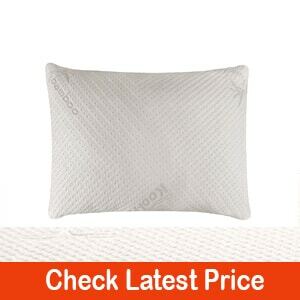 The foam used in this pillow is CertiPUR-US certified, and they use the high-quality material. It is also hypoallergenic hence suitable for those with allergic reactions to mite, bacteria, and dust. It also comes with an easily removable cover made from bamboo. What this material absorbs is sweat hence cooling is enhanced. The removable cover makes the pillow easy to clean. Some find it to be too soft. This pillow from Sunbelt Products has a cover made from bamboo. 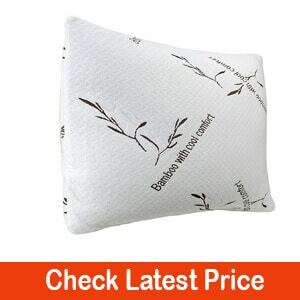 Since bamboo is known for its moisture-wicking features, this pillow is good for a comfortably chilly night. Your pillow will be dry all night, and you will sleep very comfortably. The memory foam inside the pillow also serves the purpose of keeping the pillow cool at night. The cover is made of viscous and polyester at 40% and 60% respectively. The viscous fiber in the cover is hypoallergenic and helps to fight dust and mite. When it comes to neck and head support, the shredded memory foam does a good job of cradling them. This support makes the pillow suitable for all sleepers whether side, back or stomach sleeper. 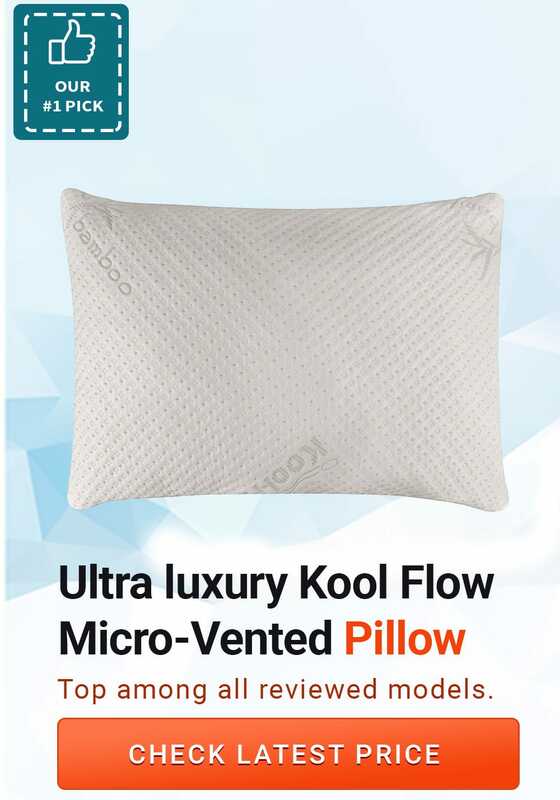 Unlike most other pillows that go flat during use, this pillow stays firm for a longer period, and you will not have any neck pain. The memory foam tends to maintain its shape while you are sleeping. Therefore, it works for people who have several conditions for example insomnia, migraines among others. It cannot be stated enough how poor sleep can affect you. The levels of irritability, your short term memory or even how you relate to other people can be in jeopardy just because you didn’t get enough sleep are some of the short-term effects. Long-term effects to your health may be increased heart diseases, high blood pressure, reduced cognitive functions or even weight gain. I hope this shows you how important sleep is for your body to function normally. Other than the significant features which a cooling pillow has to your health; there are other ways it affects you. As opposed to most other cooling devices, it works with no noise, and you can have your peaceful sleep. Another important thing is to consider is that you put your pillow in the refrigerator for a couple of hours before you go to sleep if you don’t have a cooling pillow. Therefore, having a cooling pillow saves you the trouble of having to put your pillow in the fridge. Moreover, cooling pillows are often made of memory foam and or with gel which helps with your sleeping posture. It is a win-win situation since you get an excellent night and you also avoid neck and back pain at the same time. We know that we spend most of our lives sleeping and therefore wise to spend enough money to get a good quality pillow. Getting quality stuff is not cheap so don’t be afraid to spend on something that is worth the money. As mentioned earlier, memory foam and gel are used to make the cooling pillows. Others may use material like feathers or down. They are categorized as stuffed or firm pillows respectively. Ensure that you check which of the two best works for you before buying. 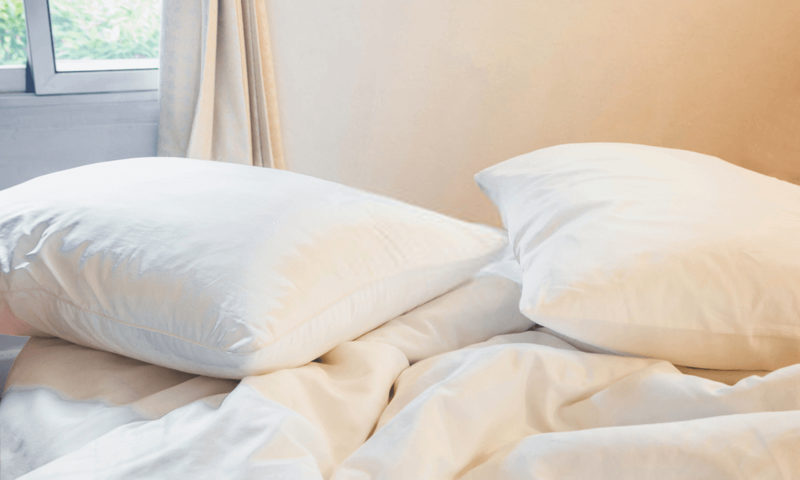 Depending on your sleeping side, it’s important to consider the firmness of the pillow. For those who side sleepers, a firm pillow is necessary so that it offers the support for your neck and back. For those who sleep on their stomach, it would be wise to get a smoother pillow while for back sleepers the firmness does not matter. The stuffed pillows may contain feathers or down material used as the “stuffing’. It tends to be soft, and the filling will keep the sleeper cool by drawing the heat at night. Some use shredded memory foam as the stuffing. It is a comfortable pillow for those who sleep on their stomachs as it is soft and cradles the head and nicely. These types usually contain solid material hence the name firm pillows. The material is of the solid block can be same or varied and are put together to make the solid block. Most cooling pillows, the solid type to be particular, tend to have another side to it with another feature. So as to ensure that the pressure is evenly distributed on the pillow, it would be wise to flip it weekly. Another important thing to consider is that the pillow has the longevity of more than a year. It would be advisable to change it regularly because we all know the more you love it, the more your use it, and the more it gets spoilt. An otherwise cheaper method would be to change the pillow covers weekly to slow down its wear. Also, remember to follow the cleaning steps when changing the pillow cover carefully. Not only is it firm and of high quality, but its material is the perfect remedy for a comfortable night. All these features it has are those we mentioned above in "how to choose a cooling pillow." With this pillow, you will have a couple of years of cold nights and still have it when the weather changes. I hope this article is helpful to you. Do you have any questions or comments? Drop a comment in the section below and let us know what you think. Also, don’t forget to share the article with your friends and loved ones.